TEMPO (The Epicenter Musical Performance Organization), dedicated to the pursuit, performance, and perseverance of contemporary music, was formed in 2008 at California State University, Northridge by Daniel Kessner and Julia Heinen. The ensemble of flute, clarinet, violin, viola, cello, piano, and percussion consists of faculty, alumni, and friends, all of whom share a passion for performing works from the 20th and 21st centuries. 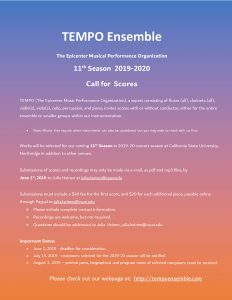 In 2019-2020 TEMPO celebrates its 11th season of bringing contemporary music to the world. In addition to programming established contemporary works, it also hosts an annual “Call for Scores,” selecting several works to feature each season. TEMPO (The Epicenter Music Performance Organization), a septet consisting of flutes (all), clarinets (all), violin(s), viola(s), cello, percussion, and piano,invites scores with or without conductor, either for the entire ensemble or smaller groups within our instrumentation. Note: Works that require other instruments can also be considered but you may wish to check with us first. 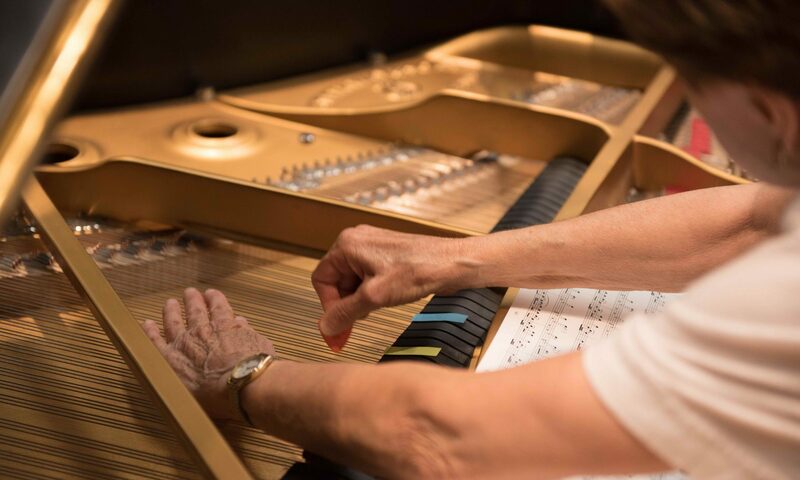 Works will be selected for our coming our 11thSeason in 2019-20 concert season at California StateUniversity, Northridge in addition to other venues. Please include complete contact information. Recordings are welcome, but not required. Questions should be addressed to Julia Heinen, julia.heinen@csun.edu. Thanks to all the fantastic works we had submitted for 2018-19 season!